Judy’s Magic Cast-on: how to start your socks from the toes. When you start socks from the toes, you need to be able to knit in the round right from the cast-on. And you need to have a cast-on which blend perfectly in your knitting, otherwise you’ll get a bump or even worse a seam line which will undoubtedly give you blisters. My preferred way to cast-on toes is to use the Judy’s Magic Cast-On (as published on Knitty), first cousin of the Figure-Eight Cast-On. This cast-on can be performed both with double-pointed needles or a circular needle (way much easier with the later). It uses both the tail and ball yarn which means you’ll have to start with enough tail yarn to cast-on all your stitches. For a sock usually ~15 cm / 6″ is enough as there’s not a lot of stitches to start with! Attach the first stitch to one of your needle through a slipknot stitch (hereafter called needle 2). Maintain both the ball and tail yarn away one form another with your left hand. The yarn from the ball should be around your thumb (at the bottom) and the other one at the top. Place the other needle ON the yarn (needle 1). The slipknot count as your first stitch. To form a new stitch on needle 1, wrap the yarn over it from the bottom with the tail yarn. To form a new stitch on needle 2, wrap the yarn over it from the top with the ball yarn. Repeat steps 1 -2 until you get the desired number of stitches. Be careful, you need to have the same number of stitches on each needles! Now that you have your stitches, you need to start knitting them! If you look closely to them, the stitches on the needles already look like stocking stitches. 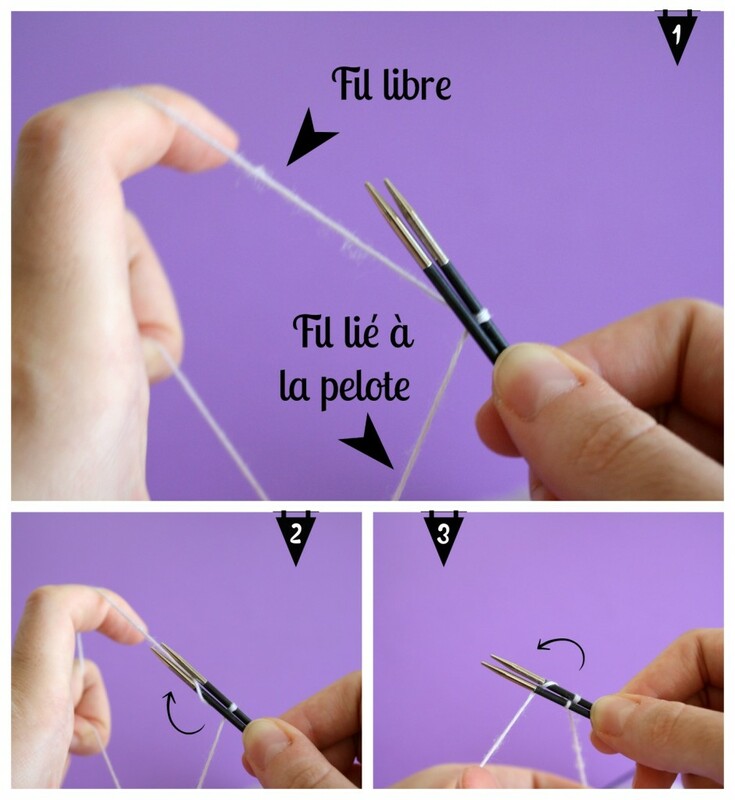 In order to start knitting stitches from the needle 1, you need to turn your work. Start with stitches from needle 1. Leave the tail yarn loose and wrap the ball yarn around. It will anchor it. Knit across all stitches from needle 1. If you’re using double-pointed needles, knit half of the stitches, then add a new needle. If the first stitch is too loose, gently pull the tail yarn to fix it. Turn your work 180° to the right, in order to be able to knit stitches from needle 2. Knit across those stitches from the back loop. 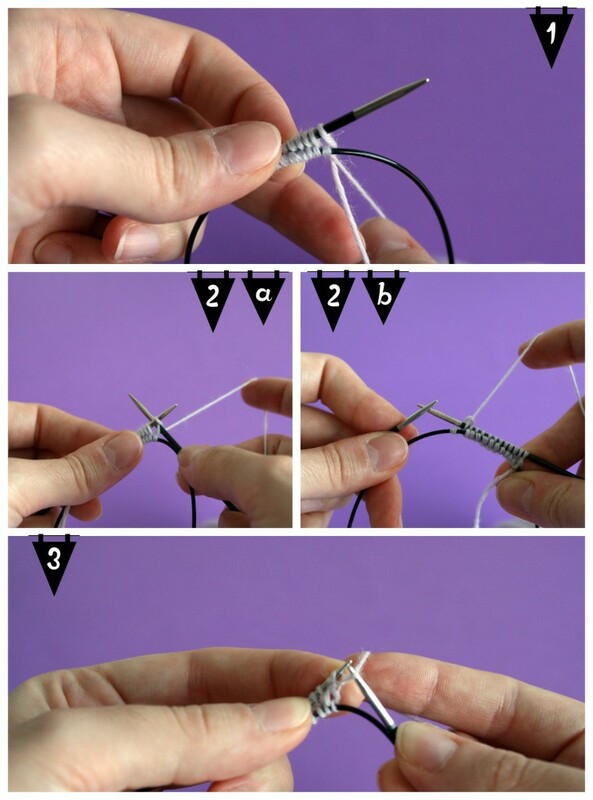 As before, if you’re knitting with double-pointed needles, you’ll want to add a fourth needle. Starting from there, you’re back a classic knit-in-the-round kind of knitting. You only have to knit, knit, and knit to get new socks!